Char broil smokers have two chambers which connect the pipe for two types of cooking – the main grilling area, where the wood chips are put for smoking meat and a smaller firebox where the charcoal is placed. Here are a few easy guidelines on how to use the char broil smoker for smoking food. All char broil smokers don’t have the same design. In some smokers the firebox is on the side while some have it at the bottom where a barrier is used to redirect heat to the grill. Make sure the grates are clean to prevent the food from sticking to the grates. You could use paper towels to rub some olive oil on the grates. You may use firewood or charcoal or even a combination of the two. When using firewood make sure that it is suitable for smoking as some types of firewood are not safe for such usage. Flavored wood chips such as mesquite and hickory are good choices as they enhance the flavor of the food. You may use lighter fluid to light the wood; however, do not use petroleum liquids as they tend to add an unpleasant taste to the food. Fill up the water pan and place it on the char broil smoker’s side grill. You could even water pan below the meat to collect any meat drippings. Set the smoker temperature to about 225 degrees and then add the meat. If the smoker gets hotter than the required temperature, wait for some time to let it cool down before you add the meat. Keep adding handfuls of charcoal or wood chips to keep the fire going as you cook. Use wood chips for a better smoky flavor instead of charcoal. Always remember to keep the smoker closed while cooking. Opening the smoker again and again will let the smoky flavor and the heat escape. 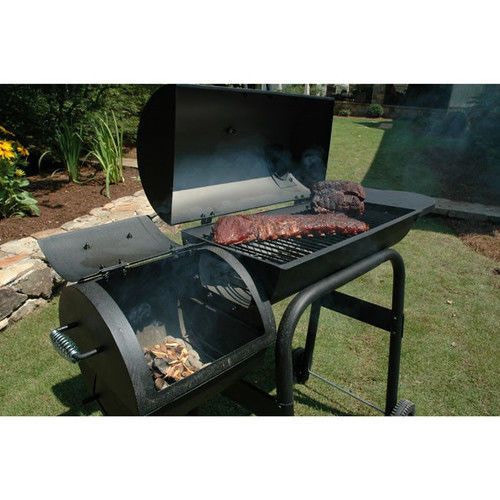 Char broil smokers can provide a whole new experience when it comes to cooking smoked foods. Rest assured you will be enjoying great smoked meals with your smoker for a long time to come.